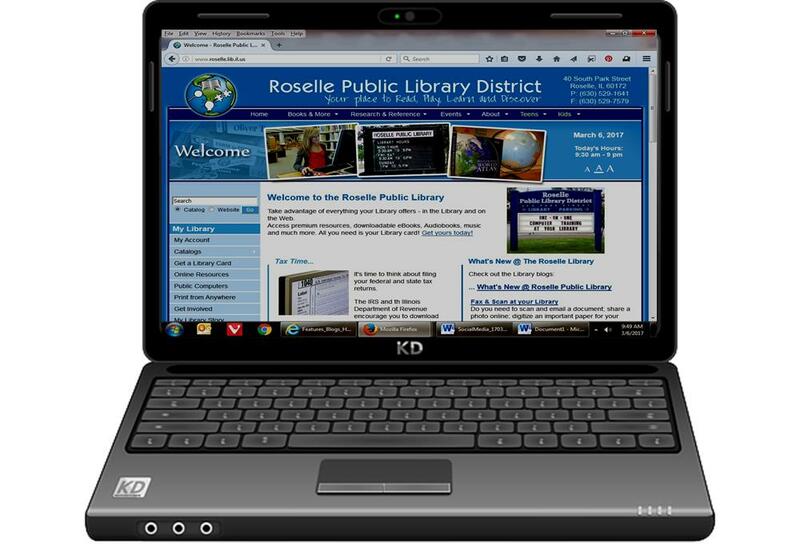 The Library has three laptops available for in-Library use by Roselle Library card holders. The Windows 7 laptops are loaded with Office 2010 applications (Word, Excel, Access, Publisher and PowerPoint) and a choice of web browsers including Internet Explorer, Firefox and Chrome. An external DVD drive is available on request. Internet access is enabled through the Library's Wi-Fi network. Printing is available via the Library's remote printing service. The laptops work just like our public Internet computers, except that you are not tied to a desk. Stop by the Circulation Desk; check out a laptop and give it a try! The Library is located at 40 South Park Street, Roselle, IL 60172. Questions? Call 630-529-1641, press 2.